Your online garden supply company for premium garden essentials and accents. Garden accents, tools and lawn care supplies from the ever popular Gardener's Edge catalog with great coupon code savings for the green thumb crowd. 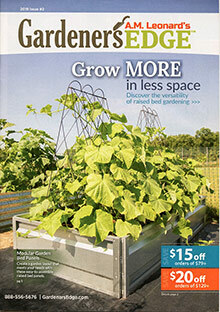 Enter the source code - COM19RW - at checkout on the Gardener's Edge website. Garden Essentials - Whether you're growing your own roses, decorating a bare backyard or harvesting a crop of ripe and tasty tomatoes, the Gardener's Edge garden supply company gives you the upper hand on a green thumb, featuring an extensive assortment of essentials for green thumbed enthusiasts of all varieties. From gloves and boots to fertilizers and mulch, you'll find composting supplies, plant supports, watering and harvesting supplies, weed solutions, pest control, and a complete inventory of seasonal necessities. Accents & Decor - Gussy up your garden with the perfect accent pieces and structures that will add grace, beauty, organization and functionality to your landscapes and outdoor living spaces. Choose from a stately selection of arbors, trellises and fences, nature inspired bird houses, bird bath fountains and feeders, space saving plant stands, outdoor mood lighting, landscaping rocks, and more decorative adornments that will enhance every inch and acre of your outdoor decor. Lawn & Landscaping - Find all of the products you need to maintain a perfectly manicured lawn, with a collection of cleanup supplies, timber and brush tools, trimming and turf maintenance supplies, edging and raised beds, lake and pond supplies, tree planting, pruning and feeding products, watering supplies, seed starting accessories, and everything else that you need to cultivate, control and conserve the richness and health of your lawn or landscape. Garden Tools - Allow the Gardener's Edge garden supply company to equip you with a thorough selection of garden tools that will tackle any gardening task while delivering professional results. From basic hand tools and edging tools to pruning, power tools and weeding tools, you'll find spades and shovels, sprayers and dusters, rakes, hoes, hedge and shrubbery tools, carts, wheelbarrows, tool belts, caddies, ladders and more. Gardener's Edge is your home base for exceptional outdoor accents as well as all-purpose garden supply tools, lawn and landscaping products, and more everyday garden essentials that will keep your backyards green, healthy, inviting, and flourishing all year round.